L-R: Gunnar Gren, Gunnar Nordahl, Nils Liedholm. My goal with this blog is to further my knowledge of Italian football by studying a different club every week and digging-up as much info as possible. Last week I took a club that I knew every little about (Cesena) and learned a lot about their football philosophy and attack-heavy squad. This was pretty easy: because I knew almost nothing about Cesena, everything I learned about the club was new to me. I’m sure I would’ve learned a lot more if I had more time to work with (the blog only started last Friday), but researching a smaller club was a piece of cake. Milan was always going to be more of a challenge. The Rossoneri are huge and researching their history online isn’t exactly difficult, but because they’re such a big club I already know quite a lot about them. You’d think Milan’s size would make them an easier club to document, but they’re not. I could’ve produced article after article on the transition between the Arrigo Sacchi and Fabio Capello eras, the impact Silvio Berlusconi’s ownership has had on the club, and the misunderstood genius of Pippo Inzaghi, but that’d be missing the point. The point of ATP is not to write about what I already know (which I could’ve done in a pinch), but to write about what I didn’t know before starting my research. For Milan, I knew I was going to have to delve beyond to ‘80’s and ‘90’s, and I did just that. Bypassing Gil Immortali and Gil Invincibili, past Milan’s 10th Scudetto and forced relegation in the ‘70’s and beyond the ‘60’s and Nereo Rocco’s catenaccio. Eventually I found myself in 1949 with three very special players. Look through A.C. Milan’s official Hall of Fame and their names immediately jump out at you. Gunnar Gren, Gunnar Nordahl and Nils Liedholm (Gre-No-Li) aren’t just the only three Scandinavians in the Rossoneri HOF, but also one of the greatest forward lines in world football history. Granted, I already knew a snippet or two about Nordahl and Liedholm, but I had no idea they’d played together and I’d never even heard of Gren. Their story is as interesting as it is extraordinary: when was the last time a country of Sweden’s size produced three world class forwards in the same generation? Milan’s current Swede Zlatan Ibrahimovic is an excellent player in his own right, but Gre-No-Li have left him one hell of a legacy to live up to. The trio first rose to prominence during the 1948 Olympic Games. Gre-No-Li played a pivotal role as Sweden won the gold medal with a 3-1 triumph over Yugoslavia in the final. Gunnar Nordahl finished as the competition’s top scorer and was the first of the three to appear on Milan’s radar. He joined the Rossoneri in January 1949 and notched an impressive 16 goals in 15 league games before the end of the season. Gre-No-Li were reunited in September 1949 when Gunnar Gren and Nils Liedholm signed together, making their debuts in a 3-1 victory over Sampdoria later that month. Milan didn’t win any silverware that season, but they did manage a whopping 118 goals in 38 league games. 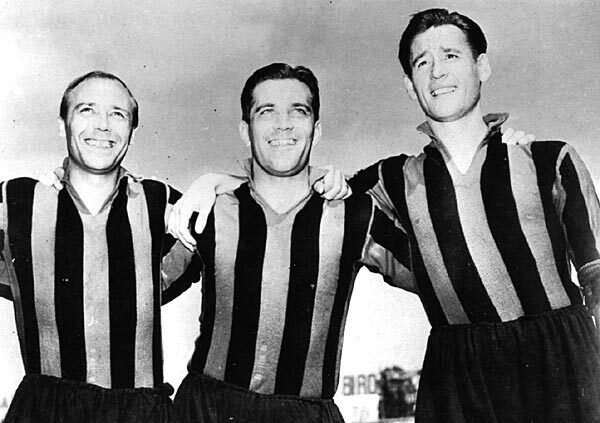 The seeds for Gre-No-Li’s success were sown, and in the 1950-51 season Milan won their fourth Scudetto. Winning Serie A was the most notable accomplishment of the trio’s careers thus far, despite their Olympic success. All three had won numerous Allsvenskan Championships back in Sweden, but none had accomplished anything like winning the Scudetto. For Gren, his first piece of silverware won at the San Siro was also his last. He had a shorter Milan career than Lieholm and Nordahl, and departed in 1953 after a brief spell as manager the year before. Gren’s contribution shouldn’t be devalued though. He scored 38 goals in 133 league appearances for the Rossoneri despite never being seen as the team’s main goalscoring outlet. During his time in Italy he earned the nickname Il Professore (“The Professor”) for his intelligent attacking play. The Teddy Sheringham of his day, Gren spent three more years in Italy with Fiorentina and Genoa, before returning home to Orgryte and retiring in 1957. Like Gren, Nils Liedholm was also more of a creator than a finisher. Lying deeper than his countrymen, Liedholm was a player of great elegance and one of the finest playmakers of his day. Known for his footballing brain, Liedholm’s pinpoint passing made him a vital component of Milan’s success right up to his retirement in 1961. In total he scored 81 goals in 359 league appearances for the Rossoneri. Unfortunately it’s impossible to find out how many assists he supplied during his 12 years at the club, but I’m willing to bet the total is huge. Liedholm was not only a pioneering playmaker, but also one of the first footballers to realise the importance of fitness. Liedholm played until he was 38, a rarity during that era. He did it by integrating pure athletics (sprints, javelin, etc.) into his training regime, making him a true athlete during a period when footballers were known more for hard drinking and chain smoking than hitting the gym. If Liedholm and Gren were creators, Gunnar Nordahl was very much a finisher. The 6’1” powerhouse is, by all accounts, one of the most dominant strikers to ever terrorise Serie A. His strength and power are very well documented, and his goalscoring record is absolutely outstanding. 210 strikes in 257 appearances make him Milan’s all-time leading scorer in Serie A, and a further 15 for Roma make him second only to Silvio Piola in the league’s all-time scoring chart. Nordahl was a great goalscorer everywhere he played. Moving to Italy effectively ended his international career, but Nordahl still managed 43 goals in just 33 Sweden appearances between 1942 and 1948. He was Serie A’s top scorer in five of his seven full seasons with Milan, and boasts a strike-rate of 0.77 goals-per-game. Ibrahimovic is undoubtedly a better technical player than Nordahl, but he has massive shoes to fill. Gre-No-Li left a huge, gold-plated legacy behind when, one-by-one, they moved-on from Milan. Gren won just the one Scudetto, but Nordahl picked-up two Serie A winners’ medals between from 1949-56 and Liedholm has four from over a decade at the San Siro. Their exploits on the pitch are forever etched in Milan’s history, but Liedholm would also go on to make a significant contribution behind the scenes. Moving into the assistant manager’s position after retiring in 1961, Liedholm became the Rossoneri’s head coach in 1963. Liedholm managed the club on three separate occasions (from 1963-66, 1977-79 and 1984-87), and is responsible for winning the club’s first gold star. In Italy it’s customary for teams to add a gold star to their jersey for every ten Scudetti they win, and Milan won their 10th in 1979 under Liedholm’s tutelage. Barrel-loads of top forwards have called the San Siro “home” over the years, but never have Milan had a strikeforce as potent and effective as Gre-No-Li. Milan’s three Swedes complemented one another beautifully and their collective medal haul truly justifies their legendary status. Calcio and indeed world football may never see their like again.